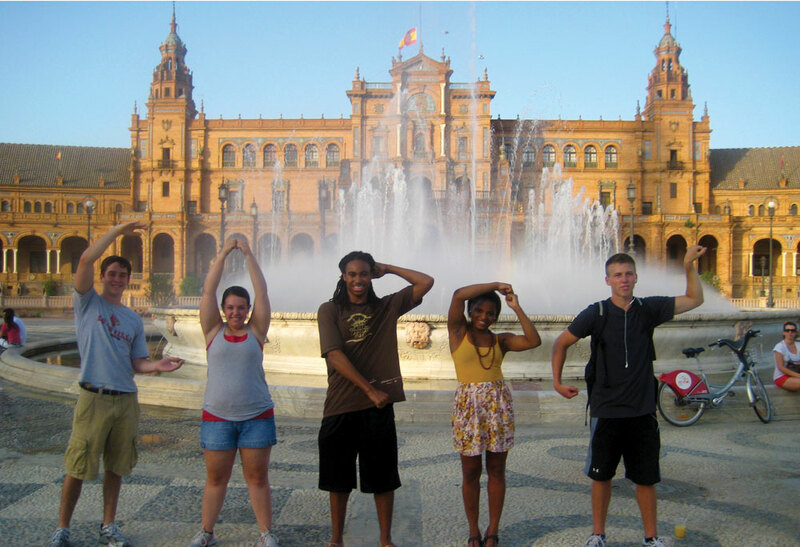 This is a post for those UofL students who will be studying abroad this spring and aren’t exactly sure what to bring with you. This is not an exhaustive list by any mean, just a few things that I brought that came in handy when traveling. Swim Towel – Most hostels will not have towels available for travelers. However, it is often not possible to bring a big towel with you when traveling, as space is a precious commodity. Before leaving, I bought one of those towels swimmers use that you just ring out and it’s instantly dry. You need to keep those towels in their small case, but overall it has served me well and has taken up next to no room in my backpack. Both a SMALL lock and a BIG lock – Hostels have all different kinds of lockers. Some are big vertical lockers like you would find in a sports locker room; others are ones you pull out from under the bed. The difficult part is that these lockers vary in size and don’t always fit a big combo lock. I brought a smaller lock and a bigger combo lock with me on each trip. I would say half the time I had to use the smaller lock because the combo lock was too big. Small 3 oz. plastic containers – When flying, you are only allowed to bring liquids that are equal to or less than 3 oz. and these must be put in a plastic see through bag. If you pick up some clear 3-ounce (or less) containers before you leave, you will be able to put shampoo, lotion, or whatever else you need in these smaller containers so you have them available to you when traveling. Money Belt – This is a super thin fanny pack that you wear under your shirt and basically in your pants that helps protect your valuables from pick pockets. You can put your passport, credit cards, cash and more in here. This way, if the worst-case scenario happened and someone pick pocketed you, they would not get these valuables in your money belt. You can look them up on Amazon.com. I promise you won’t regret this purchase. In practical use, a language barrier might be something that prevents two individuals from communicating effectively. In my recent travels, I have come to terms with a new meaning of the language barrier. Language is a big part of any culture and thus, if you want to truly immerses yourself in a cultural experience; you have to interact with the language on some level. What’s interesting about The Hague, however, is that language is not an issue as almost everyone here speaks English. I believe this presents an amazing opportunity for anyone who is in search of a new cultural experience but does not know any other languages. With this language barrier out of the way, you are able to dictate your experience in The Hague. I bike the city like the locals. I eat all the local Dutch cuisine. I have adjusted to Dutch timeliness and even became accustomed to their nightlife. With the language barrier removed, I have been able to have a 100% authentic cultural immersion in the Netherlands and I am incredibly grateful for that. I encourage anyone who fears a language barrier to consider studying in Holland. When In Holland, Go By Bike! As I arrived in The Hague at the start of the semester, I immediately noticed the lack oftraffic as I know it. Very few cars were present and taxis were almost non-existent. However, traffic came in waves of a much different type, by bike! The Dutch have mastered bike transit better than any city I have seen on my journeys throughout the world. Young children, college students, professionals in the business world and everyone in between can be seen riding a bike. Whether it’s the daily commute to work, a trip to the grocery store or a night at the movies the Dutch go by bike. People bike starting at a young age because there are no school busses, so that is the form of transportation for young students. It’s not so much a choice of transportation as it is a life style. Here in Holland people bike well into their 70’s and 80’s. Holland is geographically very flat and that combined with their mild summers and winters paves the way for a great biking opportunity that the Dutch have clearly taken advantage of. As a student, I immediately started searching for a bike the day I arrived. Within the first week I was able to purchase a bike from another student. 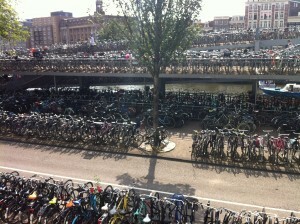 Here in Holland, there are more bikes than people so finding a bike is usually not a problem. Biking to class, the store or even to the beach has been a great cultural experience. In finding my way via Dutch transport (aka my bike) I feel like I am more a part of this culture, and that has proved to be a great feeling. If you ever find yourself studying in The Hague or living in any part of Holland, go by bike. Trust me, you won’t regret it! This weekend we traveled as a group to several locations around Panama. Between these excursions and my experiences in Panama City, I have learned a lot about the language barrier. More specifically, I have discovered that how Panamanians respond to those who don’t know Spanish is very different from how people in the United States respond to individuals who don’t know English. Overall, I have noticed that the people here in Panama are much more understanding and willing to help those who struggle with the native language. One example that comes to mind when I think about this from a North American standpoint, I think of a situation that occurred in Philadelphia, Pennsylvania that made national news. The owner of Geno’s Cheese Steaks refused service to individuals who did not order a cheese steak in English. While this seems like a simple situation, it has a meaning from deeper than what it appears to be on the surface. It shows that North Americans are far less tolerant of people who don’t know the native language, in our case, English. To compare this idea to Panamanian culture I think about the conversations I have had the last few days. At restaurants, servers have been extremely patient with me in terms of getting my order correct and helping me learn the words in Spanish. For example, I really don’t like onions so to order my food without onions I now understand I just have to say sin sebolla (without onions). I was able to pick up on this quickly because the people have been so helpful. During our two most recent excursions the Panamanians have been really understanding and have taken their time explaining things to us to make sure we understand. While this was not something I previously knew about Panamanian culture, it doesn’t come as a complete surprise. Panamanian culture is built around relationships and helping others, even complete strangers. Thus, it is not hard to believe that Panamanians are far more tolerant than North Americans when it comes to language barriers. Yesterday, a group of us decided to go explore the city. Early on we decided to try to walk to the coast line to take some pictures. Since we had no idea where we were going or how to get there, we had to ask for directions many times along the way. This is when I reinforced something I had learned early on about Panamanian culture. I quickly discovered that people were very friendly and willing to help. The next thing I noticed was the general charm that Panama City offered. Here you can find anything from an old restaurant to a brand new sky scraper. We even saw a building with a twist design. I had never seen anything quite like it before. When we finally made it to the coast it did not disappoint as we took some beautiful pictures. While the people and the buildings were great, they did not provide the most valuable lesson on this little excursion. What I learned most was what it feels like to be a foreigner in someone else’s country. As we walked around the city many people stared and even pointed at us, because we truly were foreigner visiting their country. Though this may seem simple, it really was a valuable lesson. I was, for basically the first time in my life, able to put myself in the shoes of those who immigrate or simply visit the US from other foreign countries. Because of this experience, I have gained a greater respect and understanding for what foreigners experience when they come to the US. While I was sitting on the balcony at the Las Vegas Hotel this morning, I saw a taxi hit a man riding a motorcycle and knock him off his bike. Many individuals who were around the accident at the time came over to help this man as his leg was obviously injured. Once they got the man to the sidewalk, he and the taxi cab driver had a discussion about the accident and seemed to be understanding with each other as there was no screaming or shouting involved. At almost the same exact time of the accident, another taxi stopped in the middle of the street as it became obvious that his car broke down. The taxi driver was struggling to get the car off of the main road and out of the way of traffic. As he struggled to push the taxi, a man walking on the sidewalk across the street noticed what was happening and went over to help push the cab without hesitation. After pushing the cab to a parking spot, the man talked to the cab driver and walked away. One thing that the accident taught me about Panamanian culture is that people really do handle disputes amongst themselves. As mentioned in class, individuals will talk out problems amongst each other (like in the example of this car accident) until the problem is solved. Another thing I learned was how willing Panamanians are to lend a helping hand to those around them. Both incidents personified what it means to be a member of Panamanian culture. Out of all the volunteers involved, none of them were responsible for the incidents that occurred. However, they were willing to lend a helping hand to those in need. This is something that you do not see with every culture. Today our UofL group went to take a guided tour of Ancon Hill. As we made our way up the hill, we saw some really interesting animals including toucans, spider monkeys, and vultures. 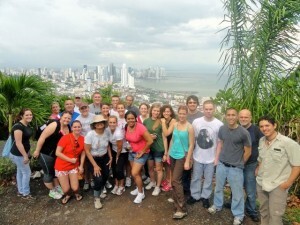 Upon arriving to the top of the hill, we had to opportunity to see a spectacular view of Panama City. After a group picture, we went to another part of the hill and were able to get a get view of the former canal zone. What was so remarkable to me was not so much the physical beauty of the scenic landscapes we saw, but what the buildings and areas represent. Our guide spoke with us about the rich history that took plac e in the former canal zone. Prior to leaving for this trip to Ancon Hill, I also read the novel Panama for Dr. Futrell’s course. Between our guide’s vast knowledge of the canal zone and the informative part of the novel, I was able to get something out of the view that had a deeper meaning than a beautiful imagine. I believe that history is extremely important because you gain a more valuable and complete understanding of someone or some thing if you know the story behind its origin. Even in listen to the tour guide and reading the novel, however, I still did not gain that full understanding. Maybe it’s true that seeing is believing because once I saw that view of the canal zone from Ancon Hill, all of that information presented to me from those two sources came together. I now have a far greater respect and understanding of the history of Panama, both from a country perspective and a political perspective, because of my trip to Ancon Hill and the view of the canal zone.